How to set your new page as the homepage of your site. First of all, here’s how to get there. Go to Site Contents, and click the +New button. Choose Page. That’s pretty easy, right? Now here’s the new page authoring experience! As of now, all web parts are simply added above or below each other, and they stack vertically. Updated 7/5/2017: I made a bunch of updates to this post, including several new web part, and several web part updates. Also, underneath each web part’s section, I added a link to Microsoft’s official documentation on that web part. There are going to be cases where the web part has been changed or updated and their documentation will most likely reflect those changes before this blog post does. Give your page a name, and you can start adding some web parts using the intuitive little + button. Once you start adding web parts, they will all have a little delete icon on the left, and some of them will have an edit icon, which opens up a web part toolpane on the right. Not all web parts have properties to edit, though. Also, notice that you can save your changes (as a draft), and you can also click the Publish button at the top right when you’re all done. The bottom of this post shows how to set this page as your site homepage. You can edit the web part titles directly on the page, for the ones that have titles. Updated 7/5/2017: You can also change your layout by adding what’s called a Section layout. Notice that when you hover over the page, you have a couple of different lines across the page where you can click the plus. The wider line will have extra options in it, for you to pick a column layout. The shorter line is actually inside of the default single column layout on the page. Updated 11/27/2017: You can click the little double-arrow at the top right (see above screenshot) to expand the screen full of web parts to make it bigger, and/or use the search box to type the name of the web part you need. Here’s the list of all the web parts, as of right now. Type free-form text here, do some simple formatting, and even choose styles like Heading 1, 2, 3. This is SO much better than the old image web part ever was! Check it out, as soon as I decide to add an image, it prompts me to select an image from Recent, Site (this site), or Upload. Whatever size your image is though, that’s the size it will show on the page. There’s no re-sizing it later. I can type a caption under it, and in the web part property toolpane, the only option is to add some alt text. Updated 11/27/2017: The name has been changed from the “Document” web part to the “File Viewer”. Inserting this web part will immediately bring up a list of recent documents (Office files), with the ability to switch to Site, to browse the site’s libraries, or Upload. There is a space underneath the document to add a description, and in the web part toolpane on the right, it lets you pick the page number or slide number that you want it to start on. It currently only supports doc, docx, xls, xlsx, ppt, pptx. Use an embed code to display content here. A common example is embedding a YouTube video on your page. When you click the Share button in YouTube, one of the options is embed code. Simply copy and paste that code into this web part’s properties. Pretty much any site/service that provides an embed code, will be able to be used here. Only iframe embed codes are supported, and only from secure websites (HTTPS). Here are some supported sources: Esri ArcGIS Online, GeoGebra, Giphy, Google Calendar, Google Docs, Google Forms, Google Maps, Infogram, Microsoft Channel 9, Microsoft Docs.com, Microsoft Office Mix, Microsoft OneDrive (Word, Excel, PowerPoint, and PDF documents), Microsoft Power BI, Microsoft Pulse, Microsoft Sway, Mixcloud, Poll Everywhere, Sketchfab, SoundCloud, Vimeo, Vine, YouTube. You can also embed a PowerApp, as I wrote about here. You can also click Add Content Type, to add another type, so you’re not stuck with just one. From what I can tell, you can add a bunch of them. Title includes the words – There is another box to enter the search words. Content includes the words – There is another box to enter the search words. Created by – Type someone’s name, or use [Me], if you’d like the logged in user to just see their own stuff. Modified By – Type someone’s name, or use [Me], if you’d like the logged in user to just see their own stuff. Managed Property – The managed properties are the default site columns and other built in properties. Since the Managed Property Name field has so many options in the drop-down, you can use the Find a managed property box, to type what you’re looking for. In this screenshot, see that I typed “assigned” and that made it easier to find the AssignedTo field. If you choose Managed property ascending (or descending), then you’ll have another drop-down to pick which managed property you want to sort by. Notice in this screenshot, this is a highlighted content web part showing only items that I have tagged with “power” (for things pertaining to power users). Hint: I always like to turn on the enterprise keywords feature on libraries, for quick and informal tagging). Display the content as cards (those rectangles), a carousel (similar to the image gallery web part setting), as a good old list, Updated 7/5/2017: or as a filmstrip. Type the number of items you’d like to see in this web part. There is no paging. If there’s no content in your web part, the title won’t even show. For example, if you’re rolling up all events, and you have no events, the web part won’t appear until some events exist and have been indexed. There are a couple of quick things to point out in the above screenshot. For Title, it defaults to UserName and then Title, but doesn’t actually display any of the usernames, so I’m not sure why that’s there. Also, for the Initials, that’s if you want initials to show instead of the person image URL, I think. When I changed it to a different value, it replaced the little circle where my face is, with other text. Also, note that when changing some of these, you can’t just change it to absolutely anything you want, it has to be a certain field type, etc. For example, if I try to change one of the “color” ones to a date field, that doesn’t make much sense. It defaults to the name of the sort level that you select, plus the type of content. You can just type something else instead. For example, in the screenshot above, it says “Trending documents”, but I can just edit that text directly on the page. (Added here 3/8/2017) This web part lets you type in an address, and it will automagically show a map of that location! Give the pin on the map a specific label or change the address that appears on your page. This will insert a line across your page, to allow you to delineate between different sections of content visually if you’d like. (Added here 5/24/2017) Pick a library from the current site, to display here. Settings let you choose the library, the existing view, and the size (5, 15, or 30 items). You’ll need to create your view in your library ahead of time, so that you can select it from the View drop-down box. If anyone wants to navigate to the full library to see more files, they can click “See all”. Right now, managed metadata fields don’t work in here. Also, if a user going to the page doesn’t have access to a library that you’re displaying as a web part, the whole page will pop up an access denied error. Notice that when I typed a location, it automatically shows the location on a map! Alternately, if it’s a virtual event, you can input the URL for it, in the Link field. Scroll down to type in a description, and there’s also a section at the bottom to add people. This will end up showing on your Delve profile, as an event you’re attending. This is what the web part looks like, with multiple events in it. Notice that there is a link on each one, to click to Add to my calendar. The web part settings let you choose which SharePoint calendar to show, pick a specific category if you’d like, and even pick from a date range such as “next two weeks” or “all upcoming events”. 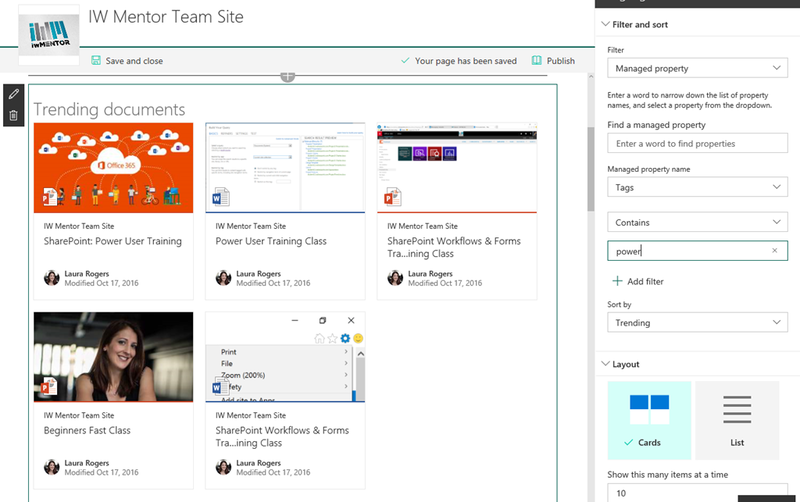 Pick an Office 365 Group, to display that group’s calendar on your page. Use the slider to determine how many events you’d like to be displayed at once. This web part is going to be perfect for putting it on the home page of the SharePoint site of your Office 365 groups, so that people don’t have to flip back and forth to Outlook in order to see the shared calendar. Microsoft Forms are a very simplistic way to gather one-way information from people inside or outside of your organization. This web part lets you put a form right on the page, and choose whether you’d like the results to show as well. (Added here 7/5/2017) The hero web part gives a lovely way of presenting news and announcements as tiles, in a couple of different types of layouts. 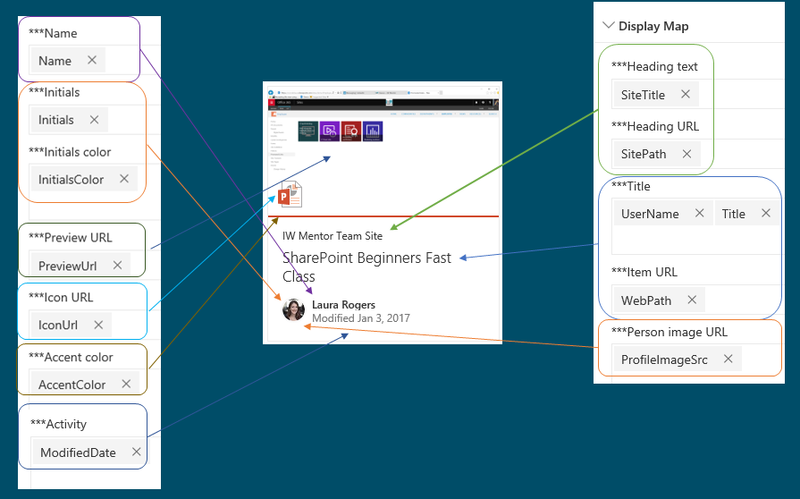 This web part was first introduced as a default part of SharePoint Communication sites, but is also available on any other modern page as a web part. In the web part settings, you can choose either a tiles or a layers layout. Within each of these, you can pick one through five. In the example above, I picked five tiles. For each tile, I then set up what image I want to show, and what URL to navigate to when the image is clicked. When setting one of these up from scratch, when you click Select link, it makes you select an image. Then, after it’s selected, you’ll have access to the properties for that tile when you hover over it and click the little edit (pencil) icon. Here are the settings for a tile. Pick a link. Type a title if you’d like, choose whether you want the title to show on the tile, pick an image. When you choose auto-selected, it will show some generic, business-type picture. Choose custom image to pick your own, or color only will just show a solid color. The color it shows is the same as your site’s theme main color. The Options section will let you add a call to action link if you’d like, but not on all sizes of tiles, just the bigger ones. Here is a screenshot of some settings, with a screenshot of the corresponding tile. You can also just drag tiles around to rearrange their order within the web part. (Added here 3/8/2017) The image gallery is a nice way to display some images from your site, with two different layouts to choose from. When you add this web part, click the Add button in order to add each image that you would like displayed. You CAN add multiple images at a time once you’re in the image selector. Each time you click Add, you are prompted to pick from Recent, Site, Upload, or From a Link. You can also optionally type in a title and caption for each image. The web part properties simply let you choose from tiles or carousel. This example uses carousel. I like the fact that all images will show as the same size in either of these layouts, so they’re not awkward looking, they’re uniform. (Added here 5/24/2017) Pick a list from the current site, to display here. This is just like the library web part. Settings let you choose the library, the existing view, and the size (5, 15, or 30 items). You’ll need to create your view in your list ahead of time, so that you can select it from the View drop-down box. If anyone wants to navigate to the full library to see more files, they can click “See all”. Right now, managed metadata fields don’t work in here. Also, if a user going to the page doesn’t have access to a list that you’re displaying as a web part, the whole page will pop up an access denied error. Updated 7/5/2017: This is what the news web part looks like when you first insert it on a page. When you click the Add news button, it’s a little confusing because it puts you on a brand new, empty page. Type a page title, add some web parts like text, images, or anything at all. Then, click Publish at the top right. This creates a new page in your pages library, which automatically rolls up in your news web part. Here, you can see that I added one page about Microsoft Teams, and it is now displayed in the web part. Also I did add one image on the new page I created, but it looks like I really should have used a square image, so that it would look a little nicer in here. As I add pages, it fills them in all four boxes of the web part. Embed a video from your organization’s Office 365 Video portal. It doesn’t have an easy video picker like for the documents and images, but it does give you a hyperlink in the web part properties to Go to your organization’s video portal. Then, go to your portal, click on the video you want, and then grab the URL of it from the address bar in the browser. Paste that in the Video address box. In my classes, students can go in here and watch the recording of their training any time for 30 days after they take the class. So, this web part is useful for quickly displaying everything they need on one page, so that they don’t have to separately navigate to the portal. The only setting in the properties is Show title and video info. Notice in this screenshot where it shows on the video, the text “SharePoint Power Users Day 1”, and all of the data under that. You can also type a caption under the video in the web part. (Added here 7/5/2017) This web part lets you manually add people. There are no web part settings, just a web part where you can type in people’s names. It resolves each name and displays their photo if they have one in their profile. You can also rename the web part (just like with all web parts), in the gray text that says People profiles, you can type anything you want, like “HR Department Contacts”. Then, when people visit your page and click on a person, the profile info shows in a pretty little pop up box, which is good that it doesn’t navigate them away from your site. Pick which report you want to use. So, so from app.powerbi.com, log in and it will take you to My Workspace. Click the little hamburger (three lines) menu on the left, to expand out the left pane. Go to the Reports section, and open the report you want. Click the File menu, and choose Embed in SharePoint Online. That gives you the URL that you need, copy it to the clipboard, so that you can use it for the Power BI web part. See below, there are a few options. You paste in the report link, then pick a page name, and even choose the display size and whether you want the navigation or filter panes. Updated 7/5/2017: Quick links are not just the old fashioned hyperlinks that you’re used to, where you have to go find the URL and all that. This new web part is much more intuitive. When you add quick links to the page and click the Add button, you are immediately prompted with a list of recent files and pages you’ve been working on. You do also have the option of pasting a link in From a link. When you click to select an item, you are prompted to type the text for the hyperlink. You can edit the web part title directly on the page. In this first screenshot, there are the settings for the web part. The second screenshot shows settings for one individual link that I’ve added to the web part. Updated 7/5/2017: This web part shows the files that have been worked on recently on your site. The only setting is to enter a number as to how many items to show at one time. Microsoft Stream is the new video service as part of Office 365, that is replacing Office 365 Video. The settings let you pick a single video or a whole channel, and you can also pick a specific place within the video to start from. For the Yammer feed, in the properties, simply paste in the URL of a Yammer group, person, topic, or home. You can choose to display it as small, medium, or large. Thanks for the tutorial! Have been so excited for this. I’m sure it will only improve with time and iterations. Quick question… if we want to convert our existing site home pages over to this new responsive style, what’s the best way to do that? Create a new page and then use Sharepoint Designer to set it as the site homepage? Thanks! You can’t convert existing pages. You’d have to create a new one. Awesome Article as always Laura. i like – how can i filtered “assignedto” to the current user? In views you can use [me] and in the modern way? Take a look at the Highlighted content web part. Also, I demonstrate in the video how you could do that. Hi Laura, Do the new webparts allow you to show promoted links libraries that were created on a totally different subsite? No, the only (out of box) way to show promoted links from another site, or anything from another site, is to use the content search web part. But then it wouldn’t look like a promoted link. So, if I still need to show a particular view of a portion of files in a document library, based on it’s metadata/filtering, how do I do that using the new UI? (i.e. the way it used to be done: addition of a web part to the page for which you can choose a particular view and, if necessary, modify it just for its use on the page) or is that impossible with the new? If it is impossible, please help me make the paradigm shift and show me how to achieve the same goal…and to be able to convince my end user who still wants to see several views of several different list/libraries brought together on one page that is easy to view/use on his android or apple phone. Hi Lisajo, it looks like there isn’t currently a way to do that. So, do you have any suggestions that might address this type of expectation in some manner while using the updates that Microsoft is rolling out? Is the Power BI web part available on the developer tenant? If so, how can we get access to it (I only see the default 11 as part of my tenant). When will your next video be posted in regards to the Power BI webpart – looking forward to it. Thank you very much! Best article I’ve read on the changes. One question though, any easy way to change that awful gray graphic at the top of the pages? MS should really have documented these better, and its a little frustrating the Publishing Site wont get the changes until next year. Incredible, don’t know why they didn’t just leave it blank. I’m not seeing a Document Web Part as referenced above? Where is that and how do I make it available in the site collection? I’m trying to show a PowerPoint presentation in a webpart where the user can navigate through the slides in the web part. EverythingI tried cannot do it. HTML Web Part with embed code, Embed code right within a snippet, a Content Web Part… They show the first slide but the navigation bar at the bottom doesn’t have any info. Are you looking at the modern page experience in your tenant, and did you create a page in the way instructed in this blog? These web parts only exist on the new type of page. Earlier this week, I set up a modern page with the Highlighted Content web part with the card layout. Worked perfectly. Went back to the page last night and nothing was displayed. When I change the layout to list or the new carousel layout the expected files display just fine. I created a new team and tried on the site there with the same result. Has anyone else seen this? I haven’t seen that, but maybe it’s buggy because it’s brand new. You mentioned that you cannot display specific lists and libraries on the new modern pages. Do you know if that is something they plan on rolling out? If not, do they expect you to continue to use the old Page types for that? Im not sure when they plan on rolling that out. I know I’m late to this party, but the lack of a list view web part is really troubling. Is it possible to get the new “modern pages” in an existing SharePoint Online site? When I go to a Site Pages Library and click new, the only options are still Wiki and Web Part pages. If I go to the main SharePoint Online home, I can create a new site that has this option. How does one Unpublish a news page. It appears that I have to delete the page to remove it from my news list ! maybe try changing its content type? There definitely isn’t a pretty way… yet. They just added a new “Discard Draft” button, so when you’re editing a page, it shows at the top of the page. What does the trending filter on the highlighted content do? I try to add a document or an image, when I save it, I receive an error saying ‘Could not save your changes. We’re sorry, we encountered an unexpected error. Please try again, if the problem persist, please contact your administrator”. can i add custom web part in modern site view? I think they’ve just released some new way to develop in SharePoint, a new framework. I’m not a dev and have no idea what that even means, but yes, soon. I noticed in the first image of the article you have two things that I cannot figure out. One, how do you get site visits I did not see that as an option. Also, on the trending webpart you have actual view counts. Thanks for a good tutorial, Laura. I am just surprised that you can make the Hightlighted content web part work with tokens like [Me]. Filtering by tokens does not work in my environment. I have asked the Microsoft SharePoint development team about the issue, and they say that this is not supported yet… Could you elaborate on this and explain how it is possible that this works in your tenant? This is probably a stupid question, but I cannot see the latest Modern Web Parts on my share point site, No document Library or document list etc. I just have the basic set, how do you add them to your site? HI Laura, I have the Site Pages option, what I do not have is the full set of Modern Web Parts available. I only have – Text, Image, Document, Link, Embed, Highlighted Content, Bing Maps, Image Gallery, News Headlines, News List, Office 365 Video, Power BI (Preview) Quick Chart, Quick Links, Site Activity and Yammer Feed. I do not have Document Library, Image Gallery or List. How do I get these Modern Web Parts? Oh, you just have to wait for them to roll out to your tenant. That one hasn’t rolled out to any of my tenants yet. It’s probably on the way, so look out for it in the next couple of months. Hi Laura, is it possible to hide an image in the news page, so that it is still used as the roll up image in the news web part on the modern site, but not visible in the news page? I doubt it. Maybe they’ll add that later, though. How can I display events created in Group exchange calendar on to modern page of the site? Hi Laura. Thanks for this, it’s a great reference. Microsoft removed it, apparently it was a beta. Thank you Laura for excellent presentation. I found possible bug from file web part. When I add excel file from the document lbrary, there is option to choose which part of the Worksheet I would like to show, all, charts or tables. However all the charts from worksheet are visible although I give a specific chart name to the name field. One thing I cant find is recommend images sizes for things like the banner image, quick link images, and hero images. mine are either too big and don’t look right or to small and pixelated. Have you seen any documentation on that? I have added a News webpart to a group page to which I have then added news items. When I use the send by email option it does not send the email to any of the recipients. Great Post! Is there a way to connect the modern web parts? Thanks for the quick response. Is there a workaround, like using links to point to a list / document library view with a filter in the query string? I am not trying to get you to do my work, but I would appreciate it if you can point me in the right direction (I would prefer to not have to write code if possible). Thanks again for the quick response. My workaround is to use classic pages if I want to do web part connections. Understood. Thanks again for your help and quick responses! Hello, I would like you to clarify a doubt, because when I installed my sharepoint server 2016 it looks exactly the same as sharepoint 2013, and therefore I do not see all the options or web parts that you take as examples. What do I have to install so that it looks like this? This is SharePoint Online in Office 365. Not sure how/if you can get this in on premises yet. Thank you, I already downloaded the update KB 4011049 and KB 4011127, it is a shame that in a basic installation of sharepoint server 2016 you can not get all those improvements that you present in your article, and there is no offline version of office 365. I want to thank you for the promptness of your reply, I have consulted other authors and almost never get an answer, Thank you very much, I would like to know if I have any questions about sharepoint I can appeal to you and if you have time, I can respond. A greeting. Super useful reference. Thanks, Laura! Great reference, very useful. I agree with the others about the size of the graphic, it would be great to be able to size it. One question, is it possible to put an email link or form to send via email to a help desk for example? If so how can it be done? Can you use Microsoft PowerApps & Flow combination to complete a form and have it emailed? Hello I am using SharePoint Online and created a New Wiki Library ( called News Posts ) on my site. I added the Site Pages Content Type to News Posts ( had to activate via SP Designer ) so that the New Experience Pages could be created. My goal in doing this is so that I could have one Wiki Library ( Site Pages ) which would be only for the Home Page and other pages used to navigate around the site. The News Post page would be used for creating News Pages for display in the News web part. This would replace the use of the Blog template on the old SharePoint experience. I can successfully create new experience site pages in the News Posts library. But the pages save into the default Site Pages wiki library. I tried activating Publishing and the pages still go to the default page library. Do you know of any other way to redirect pages where I want them stored? 1) I don’t see “Section Layout” on my page when I click on the “+” sign. 2) Can an existing/custom webpart be added to the page? 1) I can’t find the “Section Layout” when I click on the “+” sign. Anyway: Having created some web-parts on your page, the extreme left side shows the frame of the section boundary, with 3 little icons; one of which is Edit Section. When you click and re-click it, the editable properties panel should appear at the r.h.s. of the screen. I currently a Table of Contents web part on a site that is rowing up a list of sub-sites. Does the new page offer a way to add the Table of Contents web part on the page. Nice post And Thanks a lot Laura ! I have a question, my problem at the moment with Modern UI is to categoryze the pages ! In your post and video you have given us how to categoryze documents but how to do this with page ? It’s really easy for user to make page but how to categoryze the page ? If yo ucreate modern UI page the page will be post under Site page library and impossible without coding(I mean modify css and page template) to add some fields with choice to “tag” the page. Do you meet this kind of problem ? There isn’t a concept of categorizing pages currently. You would just manually create the hyperlinks to look like they’re categorized. We’re excited to announce the availability of custom metadata integration with modern SharePoint Online pages and news. With this change, modern pages will take advantage of custom columns added to a pages library, which will enable grouping and organization of modern pages. This message is associated with Office 365 Roadmap ID: 27251. For users that have been granted SharePoint Online page authoring permissions, this feature will enable them to add columns to modern SharePoint Online pages. Additionally, users will be able to add/edit the values of custom metadata columns of individual pages via pages library. We’ll be gradually rolling this out over the next couple of weeks, and we anticipate rollout completion by the end of May. Great post. In the classic view I could remove the Title field and toolbar. How can I do this in the modern web parts? There isn’t a setting for that, but you can just type a different name for the title, right there on the page, and I think you can just clear it out if you’d like. I think they’re working on it. Not sure exactly. Do you know how to add existing top navigation bar in modern pages. There’s this new thing called Hub Sites. I’m not sure what you’re asking, but if you want a global navigation bar, that’s where you’d do it. Does the Image Gallery Carousel follow suit to a particular image size/pixel dimension as all my images appear to be vertically stretched. Is there an update to the list with the newer released web parts?